Create your first wallet according to this guide, using the passphrase for backup. 1. Navigate to the wallet application, click ‘Get Started,’ ‘Next,’ ‘Create ELA Wallet’. 2. Enter your email and click ‘Continue’. Once reviewed, click ‘Confirm’. 3. Click ‘Backup Wallet’, then review the security statement before clicking ‘Next’. 4. Write down the passphrase. 5. Verify the passphrase on the following screen. Click ‘Confirm’ once finished. 7. Enter a ‘Spending Password’. This cannot be recovered. Click ‘OK’ when ready. 8. Navigate to the ‘Home’ tab, then follow the steps according to the ‘New Wallet Creation’ guide below. 1. Click the ‘Receive’ tab. You have now generated a new receive address for your Elastos wallet. You can also generate additional receiving addresses as needed. Click the address to copy it to the clipboard. 2. Click the ‘Me’ tab. 5. Click ‘Wallet Addresses’ to see all wallet addresses including both those that have been used and those that have not. 1. Click the ‘Home’ tab. 2. Click the ‘+’ button on the upper-right corner of the wallet to enter the ‘Add Wallet’ page. 3. Click ‘New Personal Wallet,’ and fill in the wallet name. 4. Click ‘Create New Wallet’. 2. Click the wallet name you created. 3. Click ‘Backup’ to begin the backup process. 4. Write down the passphrase when prompted. 5. Verify the passphrase has been backed up on the following screen. 4. Click ‘Export the Wallet’. 5. Set the wallet file password, and click ‘Download’. 1. Navigate to the ‘Home’ tab. Method 1: Use your passphrase to import the wallet. Fill in your recovery phrase. Make sure you add spaces between the words. Click ‘Import’ to import the wallet. Click on ‘File/Text’, located on the right side of the page. Select the backup wallet file. 4. Click ‘Delete the Wallet’ to delete the wallet. 1. Navigate to the ‘Send’ tab. 2. Write the recipient’s wallet address in the ‘Recipient’ field. 3. Fill in the transfer amount, and click the send button ‘ → ’. 4. Navigate to the ‘Home’ tab. 5. View the ‘Recent Transaction’ column to see that a transfer has been sent. At this moment, the UTXO is frozen. 6. Wait for the transaction to be packed. 7. Click the wallet name to see the most recent transaction record. 1. Click the ‘Receive’ tab. 2. If you own more than one wallet, please confirm the wallet shown at the bottom is the one that you want to use to receive money. 3. If you need to use another wallet to receive the money, please click the wallet column, then select the one that you want to use to receive the money. 4. Click your generated address to copy it to the clipboard. 5. Send the address to the recipient. 6. Confirm that the sender has completed the transfer. 7. Navigate to the ‘Home’ tab. 8. Check the unpacked payment information in the recent transaction column. 9. Wait for the transaction to be packed. 10. Click the wallet name to see the most recent transaction record. 1. Click the ‘Send’ tab. 2. Select a target wallet in the ‘Transfer to Wallet’ column. 3. Fill in the transfer amount, and click the pay button ‘ → ’. 4. Wait for transaction to be packed. 5. Navigate to the ‘Home’ tab. 6. Click the wallet name to see the most recent transaction record. 2. Use the recipient’s address to check the transaction status. IMPORTANT: Please make sure to write down the security passphrase to access your wallet, in case you lose your private key. This is the only address where you will receive ELA tokens. Please view FAQ below for any additional questions. Please follow each step carefully to ensure the security of your wallet. Q: What are the reasons for the new wallet being occasionally slow or freezing, and why can’t I register more quickly? A: Currently the server is in Singapore, therefore China domestic visits to foreign servers occasionally happen. Please try to refresh and register again. Q: I have previously registered a test wallet, why do I have to use a test wallet to import? A: Clear your browser cache, then re-enter the registration process. Q: I registered my Elastos wallet on my computer. Can I install the wallet on my mobile phone using the same passphrase? A: Yes. Both can be used. Q: What is the passphrase used for? What questions should we pay attention to? A: Besides backup files, your passphrase is the only way to find and backup your wallet. We recommend users to write down the passphrase on paper (multiple times) and place these somewhere secure like a lockbox or a safety deposit box. If it is saved electronically, please make sure that it is offline and not connected to the Internet; a secure way to do this would be to place these words in a .txt file and save the file to a secure external hard drive that is not normally connected to your computer.. We do not recommend saving your passphrase by screenshot or photo. Q: After importing the wallet, the address is automatically added. Will the old address still be used to receive coins? A: Yes. Any address in the same wallet can be used for receiving coins. Q: It failed to import the wallet by passphrase. It says my passphrase is incorrect. A: Every passphrase in the wallet is unique. Please carefully check your passphrase to ensure there is no typo. Q: Is a password needed when I conduct a wallet transfer? A: If a payment password has been set, you need to input the password to authorize a transfer. Q: Can the wallet be backed up? If so, how? A: There are ways to backup your Elastos wallet. One method is your passphrase; the second method is to import your wallet file. Q: How can I ensure my wallet’s safety? A: The core of wallet safety is your wallet’s private key. The Elastos wallet private key is only saved locally, rather than on the Internet. NEVER share your private key or private key file with anyone that should not have access to view or withdraw on your account and wallet. 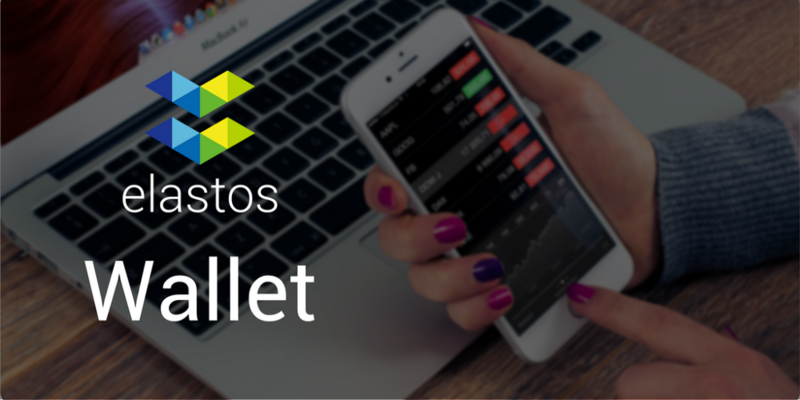 Q: Is there a desktop or mobile app for the Elastos wallet? Can I only access my wallet on the website? A: Currently, we only provide the website wallet. We will provide a local wallet in time. Q: Why does my wallet payment page not show the recipient’s address? A: It will not show the recipient’s address if there are no ELAs in your wallet. If there are ELAs, the payment page will show the recipient’s address, which may be edited as needed. Q: How do I exit the wallet safely? A: When quitting the wallet, please remember to erase browser data and use your passphrase when logging back in. Q: Is bookmarking my wallet page secure for quicker access to my Elastos wallet? A: Bookmarking is okay and does not jeopardize your security. However, it is important to record your passphrase safely offline and set your payment password. Q: What happens if I delete my wallet? A: The wallet information on any user device is deleted after the wallet is deleted. You can use your passphrase to log in on the device again, which will not affect your wallet use on other devices. We do not recommend using your wallet on an open Wi-Fi network. Please use discretion of your wallet’s security. Q: Is my password the same for both my payment password and wallet file? A: No. Your payment password is used for transferring funds or tokens while your wallet file password is used for importing the wallet, when needed..
Q: Can I shift the old address to the payment page? A: 1. Enter the ‘Me’’ tab, select corresponding wallet . 2. Enter the wallet setting page. 3. Enter the ‘More’ page. 4. Enter the wallet address page. IMPORTANT: Please make sure to write down the security passphrase to access your wallet, in case you lose your private key. This is the only address where you will receive ELA tokens. Please follow each step carefully to ensure the security of your wallet.